This year the 2018 UCI Gran Fondo World Championships were held in Varese, Italy Aug. 30 to Sept. 2, with a record number of over 3,000 athletes from more than 50 nations. Riders qualified for the event by either placing in the top 10 percent of their age group in designated UCI Gran Fondo events held around the world, by winning a national championship from their national cycling federation, or by being the previous year’s UCI Gran Fondo World Champion. 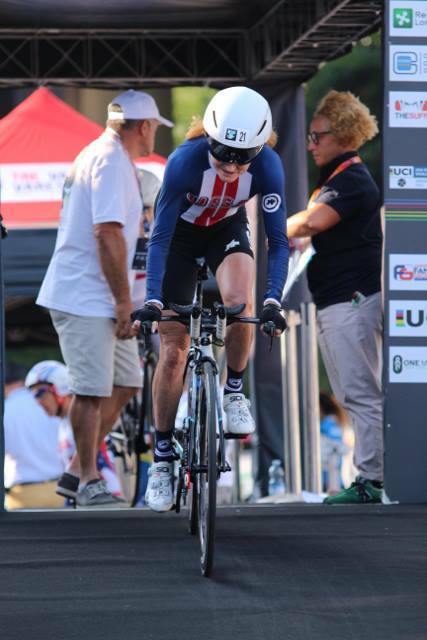 I earned my entry to the 2018 Championships having won the Road Race at last year’s 2017 UCI Gran Fondo World Championships in Albi France, and by winning both the Road Race and Criterium Championships for my age group at this year’s USA Cycling Masters’ National Road Cycling Championships in Augusta GA. So it is off to Varese, Italy we go. Entering the Time Trial and the Road Race means flying with two bikes. Bike boxes, usually considered oversize baggage, can be a huge expense when traveling, but after some research I found an Emirates flight to Milan’s Malpensa airport that accepted bike boxes as part of the two-bags per person limit on international flights. With a little creative packing, we jammed all our clothes into one large suitcase, two bikes into two bikes boxes, and a Zipp wheel bag for extra wheels; total four bags. We landed at Malpensa airport just after 12PM Monday Aug. 27, picked up our roomy, high-tech, diesel Renault Scenic and headed toward Vergiate and our two-bedroom apartment. Vergiate is a quiet, rural town between Milan and Varese and the apartment had plenty of room to build bikes and organize our things. We then headed up to Varese to drive the Time Trial course from the Ippodrome, a once bustling horse race track on the northern edge of Varese. The already tricky first kilometer out of town was made worse by the weekday traffic, but once out on the course we could start evaluating what the riding would be like; a long uphill out with a lot of fast, downhill back. A few driving miscues later and we were back at the Ippidrome track, where a cappuccino at a nearby cafe was in order. Everyone is so nice and willing to help here. On learning of the purpose of our visit to Varese, patrons steered us towards the restaurant Bologna for dinner, a local landmark, where the walls are covered with cycling photos, and jerseys hang from the ceiling, signed by Pantani, Ballan and Sagan, from the Giro, the World Championships and other major races. There was a large group of UCI officials there led by Erwen Vervecken, former UCI World Cyclocross Champion and current Director of the UCI Gan Fondo World Cycling Championships. Erwen is always gracious, supportive and we chatted for a while. On Tuesday, August 28 we rode the Time Trial course. The 22km course started just outside the Ippodromo race track, and runs along a road bordering the race track grounds, then takes a sharp left turn through a narrow street with walls right up against the road, onto a short straight section and a left turn on to Highway 233 heading north out of town. At the roundabout, the course turns right, going east for about 1 mile down to another roundabout, then back up the same road to Highway 233 heading north again, the start of the long climb toward Valganna. This section of Highway 233 contains some of the steepest pitches on the course, with gradients over 7%. In the direction of Valganna, the course passes through two, dark, one-way tunnels, continues up and levels off a bit about 2 miles before the turnaround, then backtracks along Highway 233, rolling mostly downhill back through the one-way tunnels and into Varese. To make it interesting, 500 meters from the finish, the course veers hard to the right up a short steep power climb on to a narrow street with three disruptive speed bumps and a very sharp, off-camber, right-turn back onto the perimeter of the Ippodromo track and the finish. The roads were fully open to public traffic on Tuesday and it was hard to get a sense of how it would be to race it, since we had to stop at every intersection to allow traffic to pass, but at least I was able to make note of areas of bad pavement, and where to use caution when cornering. It should be noted that Varesians are very respectful and cautious of cyclists; even though their driving is quite spirited. That night we got lost looking for a restaurant that ended up being closed on Tuesday nights. Desperate and hungry we approached a lady walking along a street who spoke no English, but was able to direct us to another restaurant at the Hotel Villa Borghi in the town of Varano Borghi, a fairy tale villa on a small town square with a restaurant, La Scuderia, that had outdoor seating. The night was perfect and we enjoyed dining at sunset in the Italian countryside. Wednesday, Aug. 29 we headed to the Piazza Republica, the Varese Town Square, for race packet pick-up and pre-UCI bike check. The piazza was brimming with vendor tents and merchandise. I bumped into a couple of people I knew from the States, but the largest contingent there was definitely British. A key feature this year was the organized, police escorted, Time Trial recon ride, where roads were closed to traffic from 2:00pm to 4:00pm, and riders could preview the course on their bikes. It was emphasized that this was a “ride”, not a “race” and to use the opportunity to study the course rather than go full out. Although it was nice to ride the course without cars, it was a touch nerve wracking riding that afternoon with over 200 riders on time-trial bikes. We drove in to Varese early Thursday morning for the Time Trial. I used one of the trainers set up for us near the start/finish for my warm-up, and then went through the final bike exam. Jeannie Longo was starting last, 30 seconds behind me (urgh!!!). As we were passing though the bike check, a fan grabbed Jeannie Longo in a headlock for a selfie with the “winningest cyclist of all time”. For a brief moment I felt some sympathy for Jeannie, but that disappeared quickly as the anxiety set back in. The carpet on the start ramp was a little slippery with officials cautioning us to be careful, but I got off to a good start. On the first part of the course I felt good and navigated the dreaded, left-hand turn into the alley. I caught my 30-second person about 1.5 miles into the course and was feeling pretty good. On the short out and back segment I saw Jeannie Longo coming down at me the other way and I figured she had not made up any real time on me; at least not at that point. But soon after I turned right on to the 7% steep part of Highway 233, she flew by, a testament to her eight Olympic medals and thirteen Elite World Championships. I caught a few more riders on the way up Highway 233, but never saw my one-minute person. I tried to push the downhills as much as possible, through the tunnels and roundabouts, and coming back into town I hit the steep short ramp with the three speed bumps as smoothly as I could. I ended up with Bronze and was pretty happy with my effort. The podium ceremony was quite grand and I was honored to stand up there alongside Jeannie Longo. The weather had been perfect since our arrival in Italy, but on Friday there were thunderstorms all day, so we drove the Road Race course in the Renault. The first 15km basically follow the Time Trial course up Highway 233 to Valganna where it heads up a steep narrow forest road with lots of turns to a village called Alpe Tedesco, followed by harrowing descent on steep narrow switchbacks to the shores of Lake Lugano near Porto Ceresio. The course then runs along Lake Lugano for three miles before heading up into the hills again at Brusimpiano. That climb to Ardena is not as bad as the first climb, but there is a section of bad pavement marked “strata ratta!” After that, more rolling hills and lots of turns drop us down on to a major highway in Marchirolo. Shortly after that in Fabiasco the course splits with the longer Granfondo route heading up to Luino and our route, the Mediofondo, precedes straight to Grantola where we then reconnect with the longer route for the trip back to Varese. Somewhere after Rancio Valcuvia there is a climb up a narrow forest road that is not really evident on the maps or the course profile; it is a wicked climb at least 2-3km with lots of turns and steep pitches. Finally in Gavirate, the course rolls along Lake Varese and back into the city through Bobbiate, an industrial area with another 5km climb back into Varese just to burn the legs one last time. After the summit it’s about 1.5km flat to the finish. I rode an indoor trainer for about an hour that evening just to keep the legs tuned up since it was still pouring rain. On Saturday I decided ride some strategic sections of the course, so at 1pm Saturday we loaded the bike into the Scenic and drove to Valganna. Just as I got on the bike, the rain stopped but the roads were soaked. I rode the first steep climb up Alpe Di Tedesco, stopping at the summit where we happened upon a gentleman parked there waiting for a rider who was doing hill repeats. Interestingly, he had once been a Director Sportif in Germany for the pro team that signed Jens Voight to his first professional contract. His English was perfect. We always meet interesting people at these events! Riding the descent from Alpe Di Tedesco to Lake Lugano was not as terrifying as driving it in the car the previous day. Of course I was cautious because the road was open to traffic and littered with sand and debris. After the descent, I cruised along Lake Lugano and rode the second climb. At the summit in Ardena, I jumped back in the car and we drove the rest of the course back into Varese and the finish. I would have liked to ride the whole course, but I also did not want to risk excessive fatigue the day before the race, so I stuck to my plan. We headed back to the apartment and prepared for the Road Race; pinned numbers on my jersey, attached the sensor and frame number to my bike, organized all my bottles and gels and bars for the next day. Race day, the weather was clear, sunny and slightly cool. Riders started in age groups every seven minutes, staged in three starting “corrals”. We had to report to the first corral 30 minutes prior to the start, and as each group took off, the next group moved toward the line. My group included the Women 50-54, 55-59, 60-64 and Women 65 and over. As the previous World Champion, I was called up to start in the first row of the group. We took off and headed out of town onto the same route as the Time Trial course toward Valganna. I stayed with the front of the group as Jeannie Longo moved up and became one of those setting the pace. On the first climb near the tunnels up to Valganna we started dropping riders and I was holding my position without too much effort. We then passed the Time Trial turnaround and headed up the narrow steep twisty mountain road, Alpe Di Tedesco. I was fine most of the way up the climb. Then Jeanie Longo attacked hard. I knew I could not hold that pace, so I settled into a steady effort I could hold. I probably should have gone as hard as I could have, but I knew I had a lot of climbing ahead of me. Continuing up, I passed riders who had gone out too hard, and were now paying the price. I did the tricky descent carefully and found it much easier and faster in the dry conditions. Once I arrived at the stretch along Lake Lugano, I got in with a group of other women and we held a good pace to the turnoff up to Brusimpiano. That climb quickly broke up the group. I was passing riders all the way up to Ardena, and then I started catching men from groups that had started before us. I continued to join other riders and re-group until we got near the feed zone in Fabiasco. Even though I planned a feed at this point, we were moving fast and I declined, given the risk and crashes I had seen earlier. Cheered on from the roadside, I was told I was about 3rd or 4th at this point, which matched my calculations. As riders from the longer race rejoined the course near Grantola, we found ourselves with more riders to work with on the road. As with many granfondo events, there is a general pattern of riders working together as a group, then coming apart on the climbs, then reconfiguring on the flat sections again. When we got to the “sneaky climb” near Orino, the large group really strung out with everyone climbing at their own pace. Finally we arrived near Gavirate and rode a few miles along the shore of Lake Varese. We had some great views as the road skirted the shoreline, especially near Calcinate del Pesce. The course then proceeded away from the lake, through an industrial area in Bobbiate for the last few miles to Varese. This area was more rolling than I had perceived in the car, and at that point in the race every little hill seemed larger and harder. Once we hit the Varese city limits, we faced the dreaded 5km long final climb to the town center. I settled in and tried to keep a steady pace. The “1k” banner at the summit of the climb was a welcome sight, and I picked up the pace. Entering the barriers, I got on the wheel of a man from Great Britain and we sprinted the final meters to the line. I finished fourth. The course was challenging and it motivated me to be explosive in the hills and confidant on the technical descents. After the race, I ran into a large group of riders from the San Francisco Bay area that qualified for this event at the Cheaha Challenge Gran Fondo in Alabama, the only qualifier in the USA. They were very friendly and were wearing really sharp-looking Castelli USA team kit that they had designed! Tanya Fredricks wore the biggest smile getting Bronze in the Women 50-54. We managed to all fit together for a group photo, arms raised. After the race, the UCI hosts a large post-race pasta dinner and the final podium ceremony. Even banquet pasta in Italy is to die for. We planned our stay in Varese to include an extra day to relax with plenty of time to pack, so the next day we drove to Porto Ceresio and rode around Lake Lugano, crossing into Switzerland and back. We took our passports along hoping to get them stamped, but they just waved us through. Then the sky opened up again and we sought refuge in a little lakeside café. There we waited out the storm trading stories over cappuccinos with a couple of younger Brits who also had competed in Varese. We enjoyed the trip and the experience of meeting riders from all over the world. Doing events like this makes me more aware of the global appeal of cycling, and it is inspiring to see riders from so many countries competing in a world-class event. I am already training to get a spot at next year’s Championships in Poznan, Poland. Will be fun to explore a different part of the world, and share the same spirit of competition!